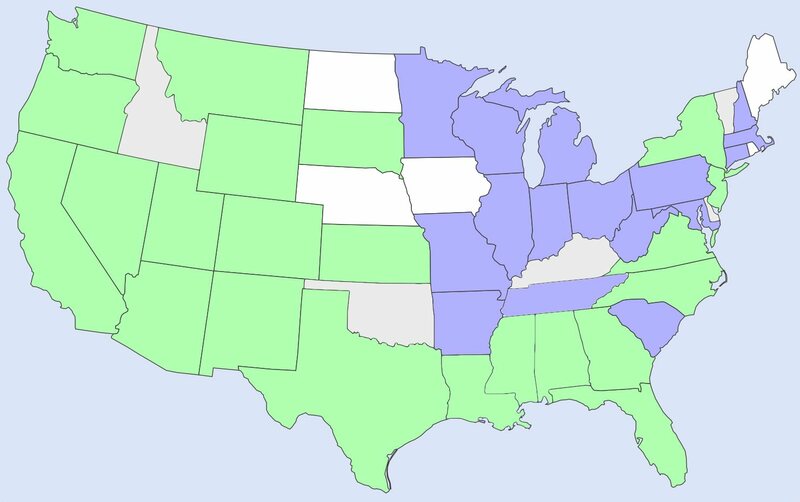 Since we’re heading up to New England and Nova Scotia this summer, we’re spending our winter in the south-east instead of our “usual” desert south-west. 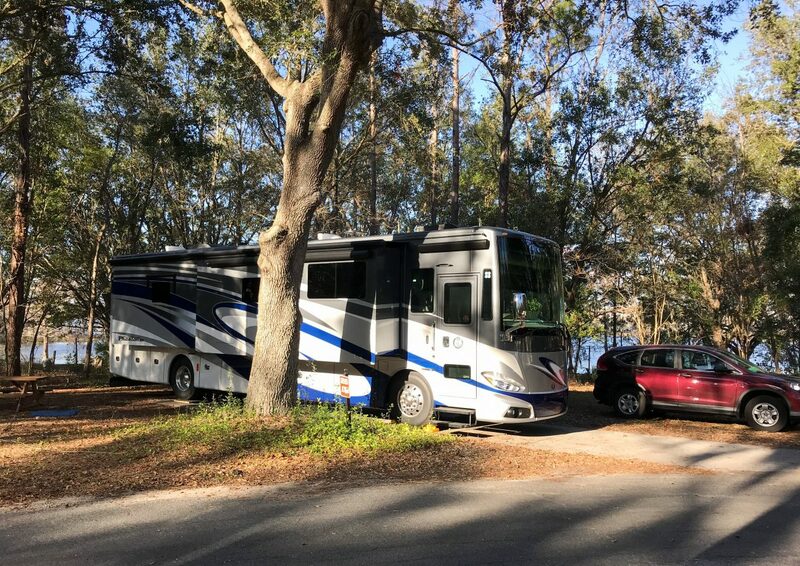 Florida is a huge snowbird destination and is full of tightly-packed, 55-and-over RV parks that are sold out months in advance for the winter months. Since that’s not our cup of tea, we made our winter plans more than six months in advance, and managed to snag sequential 1- to 2-week stays in nothing but public parks for the entire winter! While this often means giving up some luxuries like full hookup sites (many public parks offer electric and water, but no sewer), it also means giant wooded camp sites, lots of trails for dog walks, and much lower fees. 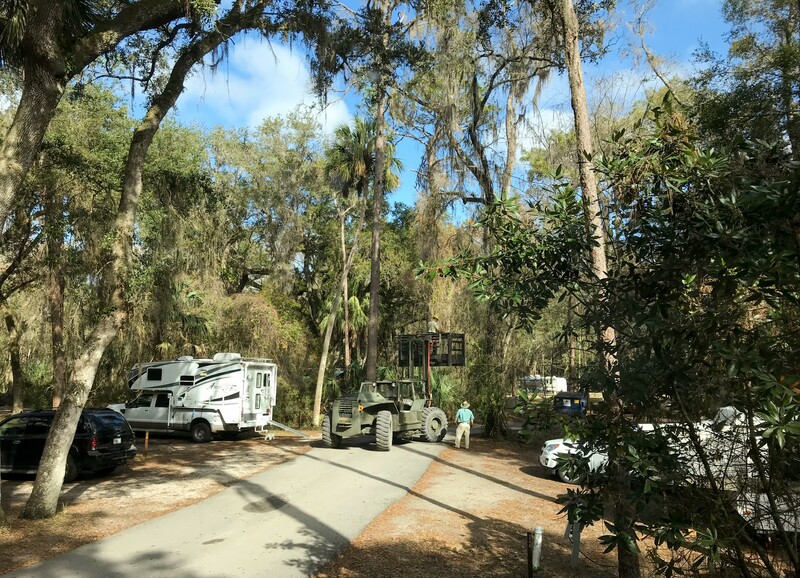 Much to our surprise, most of the Florida State Parks we camped at did offer full hookups, and all of them accepted mail and deliveries for campers, which was a huge win for us. We escaped chilly DC in mid-December and settled in at Jonathan Dickinson State Park in south-eastern Florida. 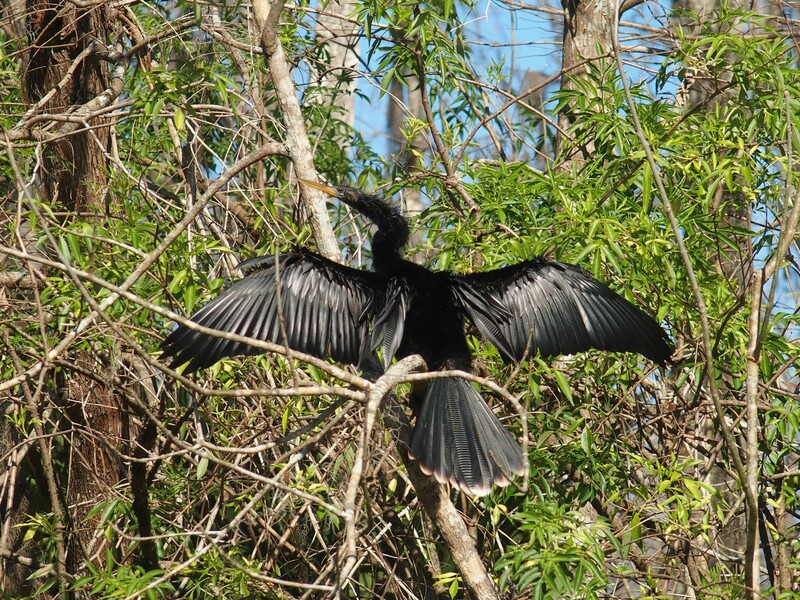 This is the winter Florida we think of: full of palm trees, warm sun, beaches. Unfortunately dogs are not permitted on the beaches and all the freshwater sources contain alligators, so Opie did not get many chances to get his swim on. The park has a lot of great areas for walking and miles of biking trails. There’s a newer section for RVs close to the entrance of the park with large paved sites and full hookups. Four miles further inside the park, there’s an older section right next to the Loxahatchee River where the views are nicer but the sites are older and smaller. Some of the walking trails were also located in this area so we had to drive here when Opie got bored of the trails around our campsite. You can also rent canoes, kayaks, and bikes at the camp store by the visitor’s center. 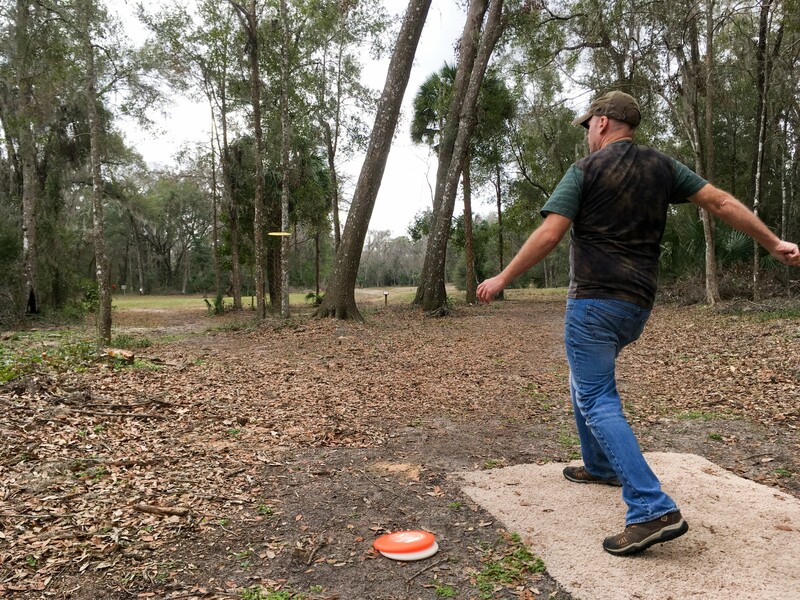 It’s a nice campground and since Jupiter is a big tourist town, it’s easy to find places to eat or things to do nearby. While at JD Park, we did hang out with a couple we met at Red Bay while our coaches were being built, and compared notes on modifications, hacks, and complaints. It was fun talking to another Phaeton 40 IH owner and seeing the experiences they were having. We also met Melinda and Erik (Pookie and the Bear) and spent a day relaxing with them. After our brief flirt with winter in Virginia, it was great to get back into our preferred “follow the sun” RV weather! Next we headed to Mom’s for our traditional winter visit. In Rover, we’ve been able to (just barely) fit into her driveway but R2 is four feet longer, so we knew that wouldn’t be possible. We decided to try parking on her large, empty lot alongside her house during our visit. Unfortunately, while we made it into the lot ok, we miscalculated just how R2’s impressive weight would react with Florida’s soft, sandy soil. 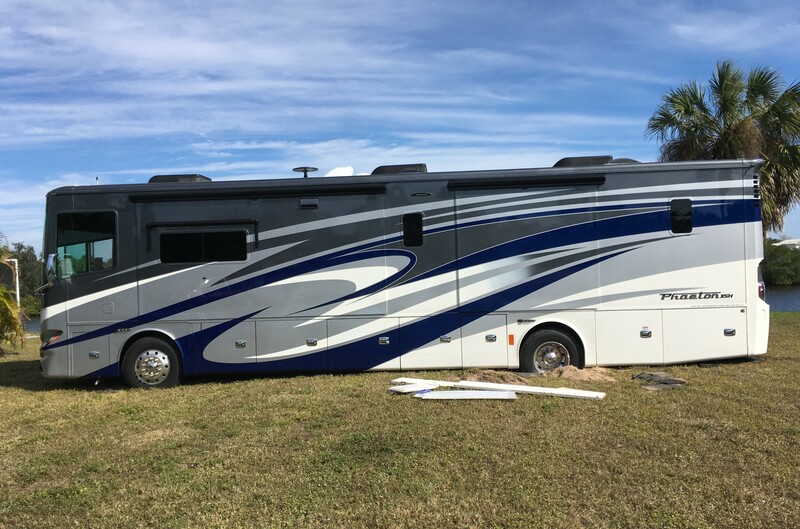 When we turned R2’s wheels, they dug right into that soft Florida sand and got stuck good! The more we tried to get out, the more our tires dug into the sand. After some hours of digging and trying to use R2’s jacks to lift us out, we gave up and went for professional help. Prompt Towing did a fantastic job of pulling R2 onto more solid ground. We were heavy enough that while his truck pulled us out, we pulled his big truck sideways along the yard! Thankfully, he was able to get us free and back onto solid ground. Staying with Mom is always wonderful since Kathie can take over the dining room for her sewing, Opie can swim in her pool every day, and we are all fed non-stop! When it was time to leave, Opie flopped belly-up onto the front lawn and wouldn’t budge. We actually had to half drag, half carry him into R2! From Mom’s house, we headed to Hillsborough State Park in Thonotosassa, just north of Tampa. It’s a much older state park with some very narrow roads, cramped sites, and low hanging tree branches. It’s always a little traumatic hearing tree branches scraping our roof, especially since R2 was still so new! Here, the palm trees are edged out by willows and pine trees, giving a more rainforest feel to the campgrounds. 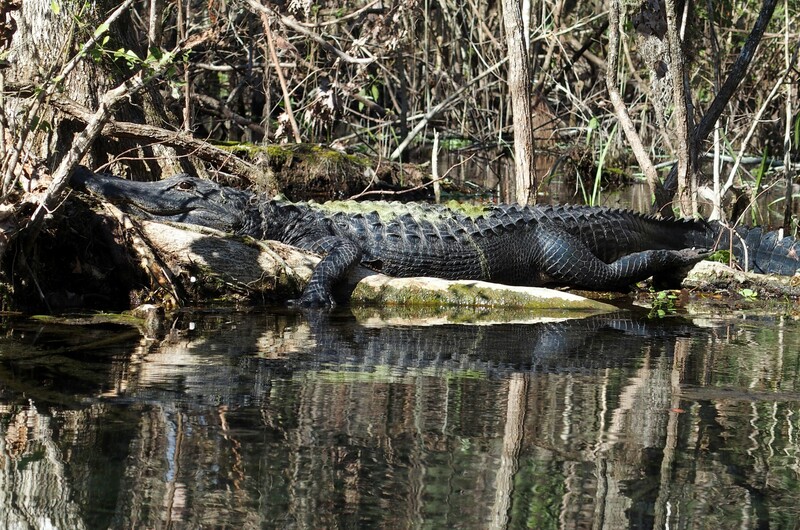 We enjoyed the hiking trails through the park although we did see some massive alligators sunning themselves along the shores. Since we walked right by the river, Opie would regularly yank us towards the water but we steadfastly refused to let him in. I’m sure he was very confused! While at the park we met up with our friends Jeff and Sue to do some fun biking near the park and catch up. 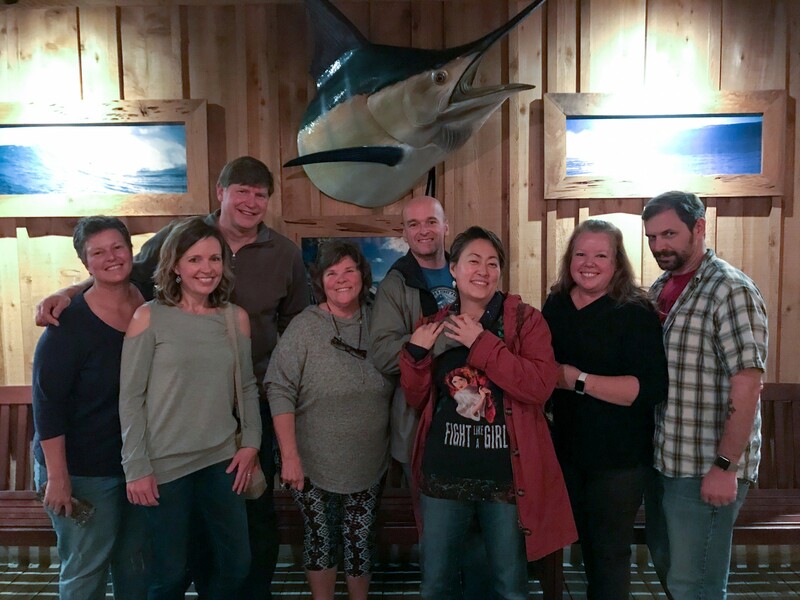 The last time we crossed paths was in Heber City, UT, and we’re still amazed and delighted how often we cross paths with friends all across the country! 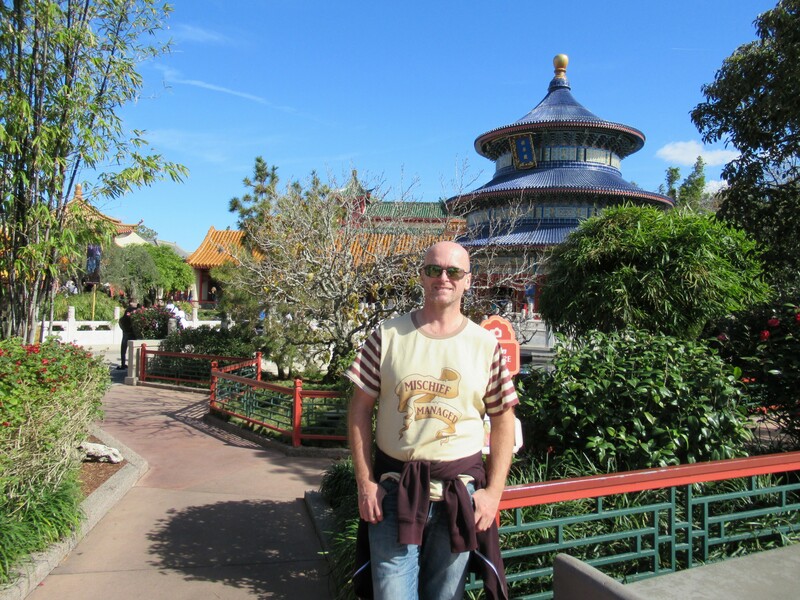 While in Orlando we spent a day visiting Epcot Center which we hadn’t been to in a long time. It was more crowded than we expected (we try to visit off-peak) but was a fun day nonetheless. We spent most of our time walking around the World Showcase, and missed most of Future World. We did try to sample as many different cuisines (if you can call country-themed amusement park food “cuisine”) as possible, until we were stuffed. While Epcot doesn’t have a lot of rides, there are some great displays and showcases and we’ll have to set aside two full days to see it all the next time we visit Epcot. Next up was a short drive to Silver Springs State Park in Ocala FL. 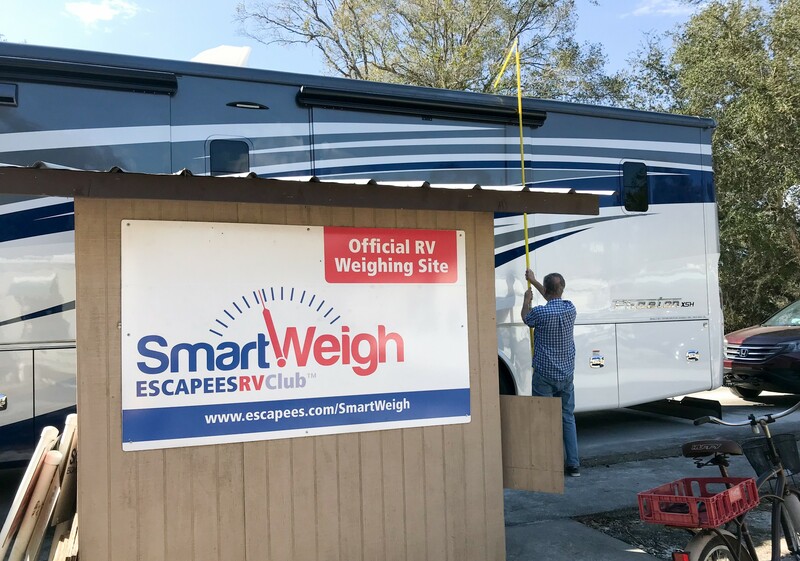 We took a slight detour to visit the Escapees Smart Weigh station in Florida to get R2 weighed for the first time with all our “stuff” in him. It looks like we’re carrying around 3,000 lbs. of cargo, including the water we had in our tanks at the time. With R2’s impressive carrying capacity, that means we still have another almost 3,000 lbs. of capacity left if needed (we’re still arguing over who gets to fill that extra space). We immediately loved Silver Springs State Park… it had a wonderful feel, and being in a mature pine forest meant it smelled fantastic as well. 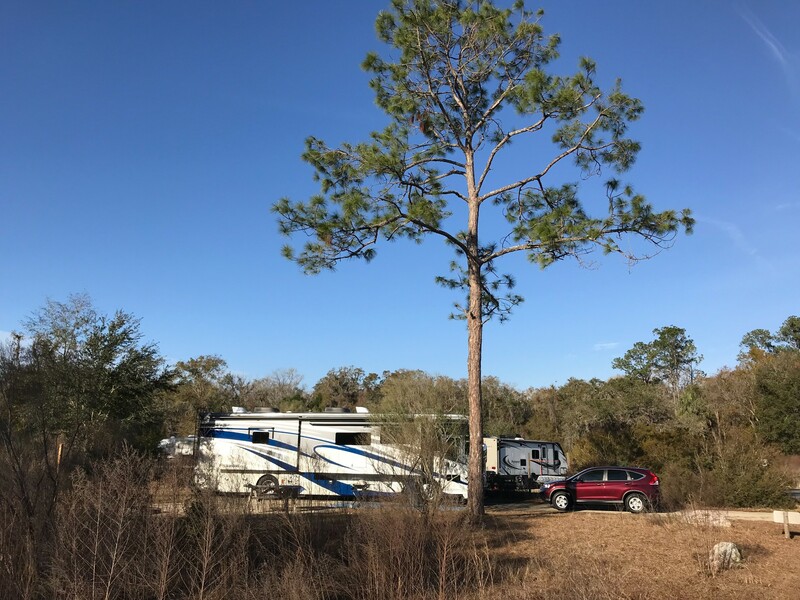 The campground was quite large, with big private sites and lots of space for dog walks, while being close to town for some stores and restaurants, with the “city” of Ocala a little further away. We only reserved a week, but wished we had booked two! 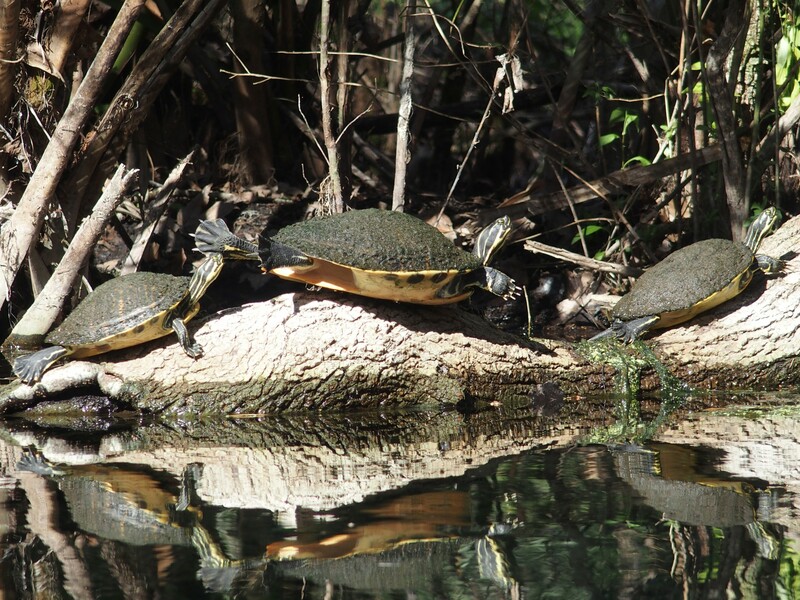 We took one afternoon to rent a 2-person kayak and explore the river, spotting alligators, lots and lots of turtles, anhinga (long-necked birds), and other wildlife along the way. It was a fun and relaxing time and we highly recommend it. 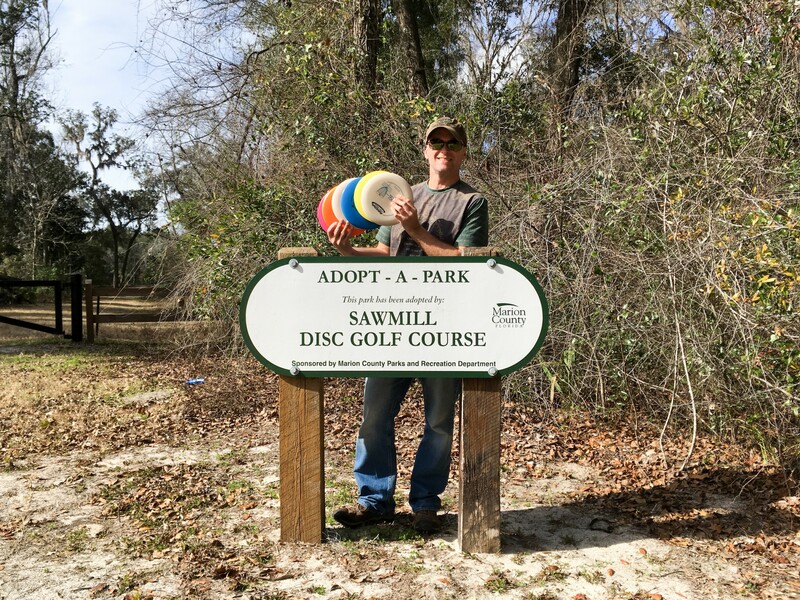 Just a couple miles from the park is a public disc golf course, where we finally got to break in our new (cheap) golf discs for the first time. 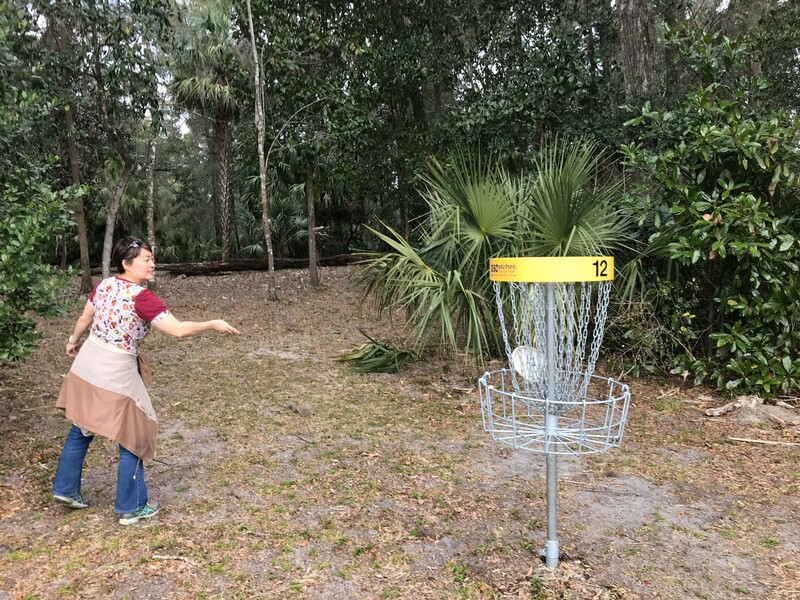 The course was in a bit of flux, possibly due to recent hurricane activity, which meant that some of the holes and tees were poorly marked and we got lost a couple of times looking for the next tee! We laughed off our mistakes and kept playing, getting better and better as the day went on, which was a nice experience. We also found a nice dog park nearby where Opie got to interact with other dogs for a change, and splash around in their kiddie pool to relieve some of his disappointment at not being allowed in the alligator-rich lakes and rivers. After a short drive to west side of Ocala we settled into Rainbow Springs State Park. 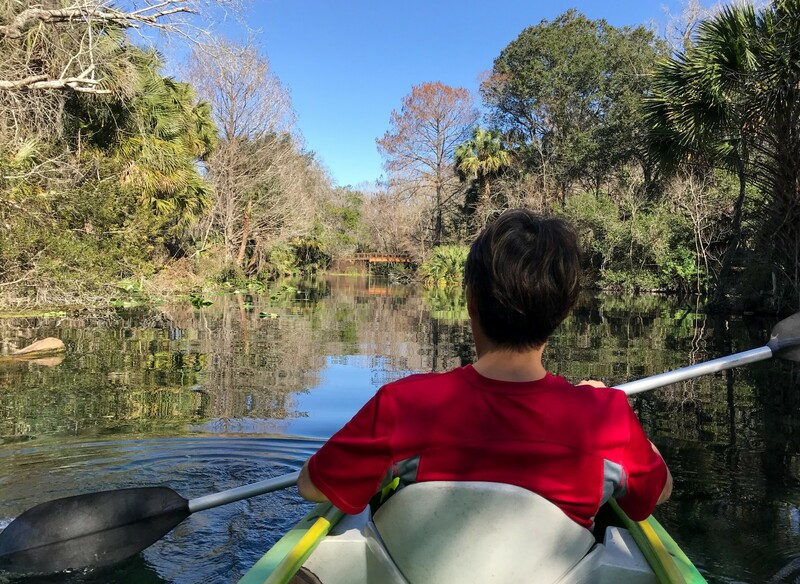 After being so impressed by Silver Springs (a definite “10” in our book), we found Rainbow Springs to be a bit of a letdown. The campground was very small, there wasn’t much to do, and town was much further away. The campground didn’t have much character, and we rarely saw other campers out enjoying themselves. There were a couple short trails around the campground that were nice for dog walks. During the summer, tubing down the river is a big draw at the park, despite the signs warning of alligators! We continued slowly making our way north up I-75, this time stopping at the Stephen Foster Folk Culture Center State Park (now that’s a mouthful) north of Lake City FL. 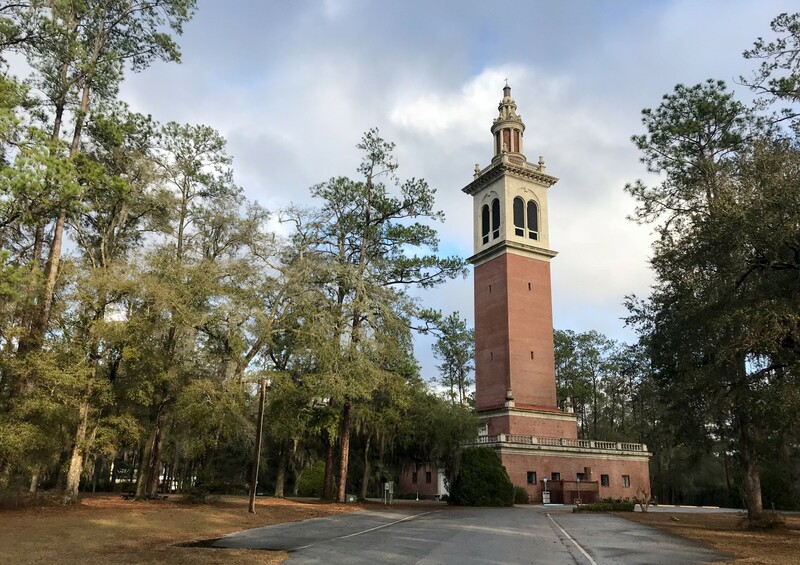 The park is named for the 1800s American songwriter and hosts the world’s largest tubular bell carillon which traditionally sounds throughout the day. Unfortunately, the carillon is currently not functioning and is in need of expensive repairs. We explored the free Stephen Foster museum at the park and learned quite a bit about Foster’s history and impact. There are many trails through the park, but during our visit most of them were closed, perhaps due to hurricane cleanup efforts. While at the park we made a new friend… Buddy! Buddy’s a stray dog who had been living in the campground all winter after being abandoned there in November. By the time we arrived, he was just starting to become trusting of people, and followed us (and other campers walking dogs) around pretty often. Most of the campers were friendly toward Buddy, though a few were clearly uncomfortable and shooed him away. By the time we were ready to leave, he was as friendly and approachable as any house pet… which unfortunately meant the park rangers decided it was time to catch and remove him! 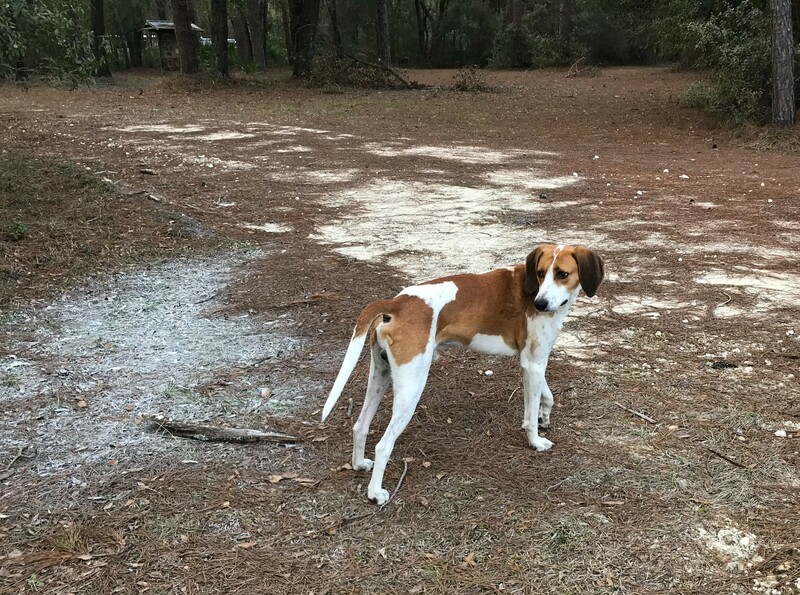 While we gave some thought to adding another dog to our home, we knew the time wasn’t right, but fortunately another RVing couple at the campground took Buddy in literally minutes before the rangers were to take him. A happy ending! After a long haul across Florida’s panhandle, we arrived at Topsail Hill State Park near Destin. Last year we camped for a few days at a different state park in the area, but the two couldn’t be any more different! While Henderson Beach was secluded and quiet, Topsail Hill is a former RV resort that was absorbed by the state park. 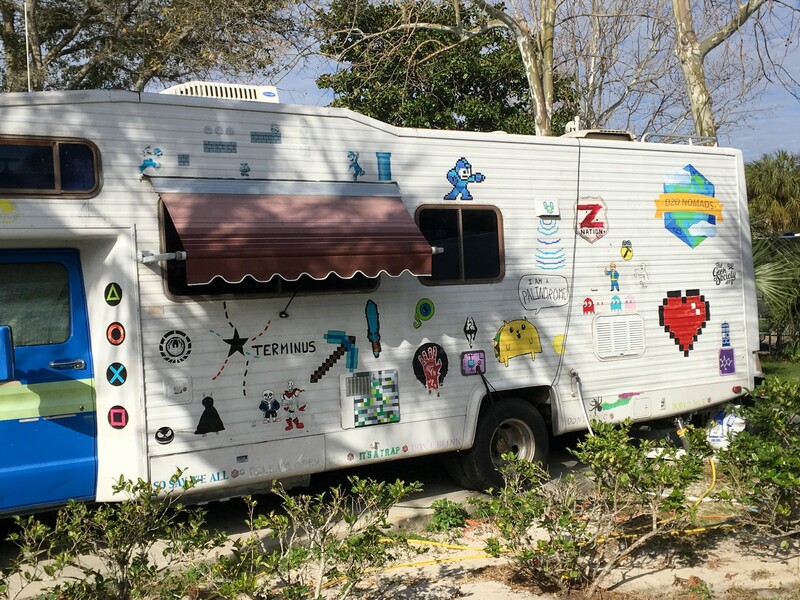 It’s a giant campground with a pool and other amenities, including full hookups. 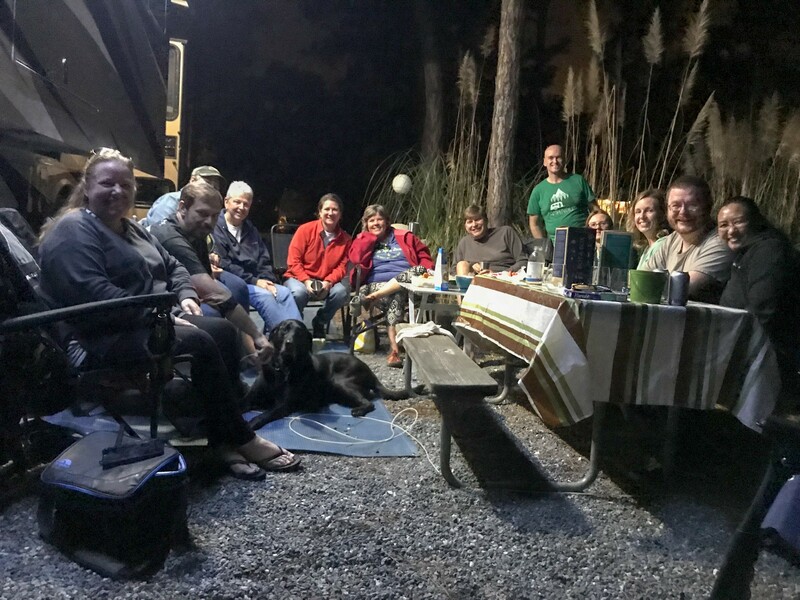 While sites aren’t as private as other state parks (and the quality of sites varies greatly), our site was excellent and we’re glad we booked two weeks at Topsail Hill. There were plenty of trails through the park for long dog walks, and the large size of the campground meant plenty of room for quick easy walks. 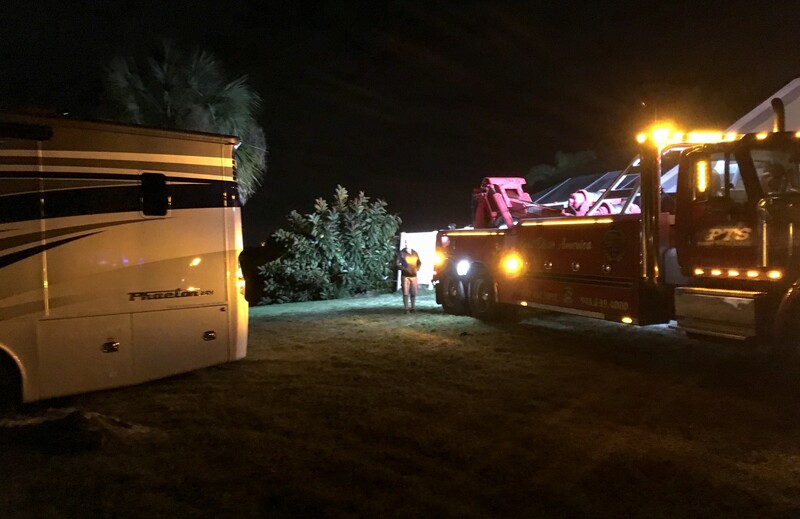 Destin seems to be a magnet for RVers in winter. We ran into some old friends there last year, and made a few new ones. 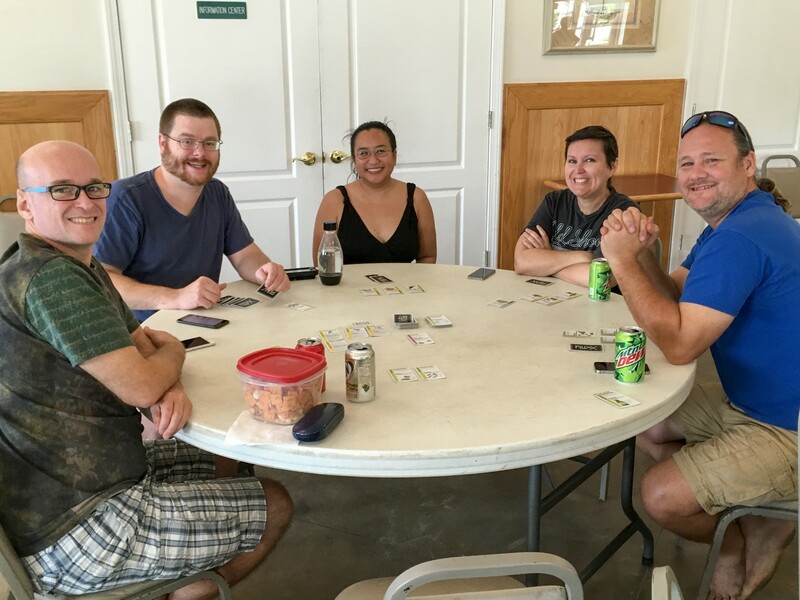 This year there were so many RVers we knew (or met) that we were busy socializing almost every day! 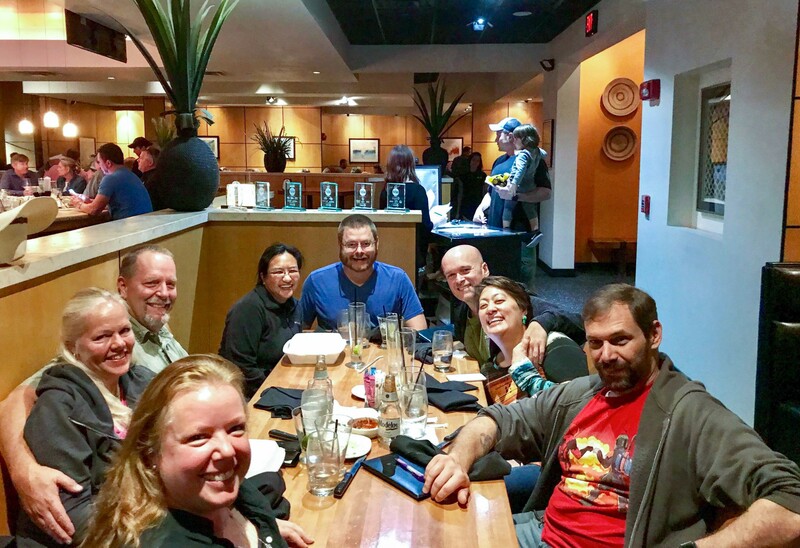 If you know us, that’s a strange statement to make, but it was great fun spending time with Indoor Nomads, Nealys on Wheels, RV-A-GoGo, D20 Nomads, Itinerant Life, RollingwithKC, Debbie/Pat, Dawn, and Jenny/Chris. We played lots of table top games, learned a whole bunch of new ones, ate and drank too much, and got to see D20’s hand painted geek/nerd sci-fi/gaming trailer Floki just before they upgraded to a new rig. Even Opie had a great time here in Destin. Destin received about 36 hours of straight rain while we were there, making for some impressive size puddles on the trails. Since we didn’t let Opie into the alligator waters, he was happy to swim in the puddles instead. Plus Opie had a chance to do morning hikes with other dogs and loved the camraderie. 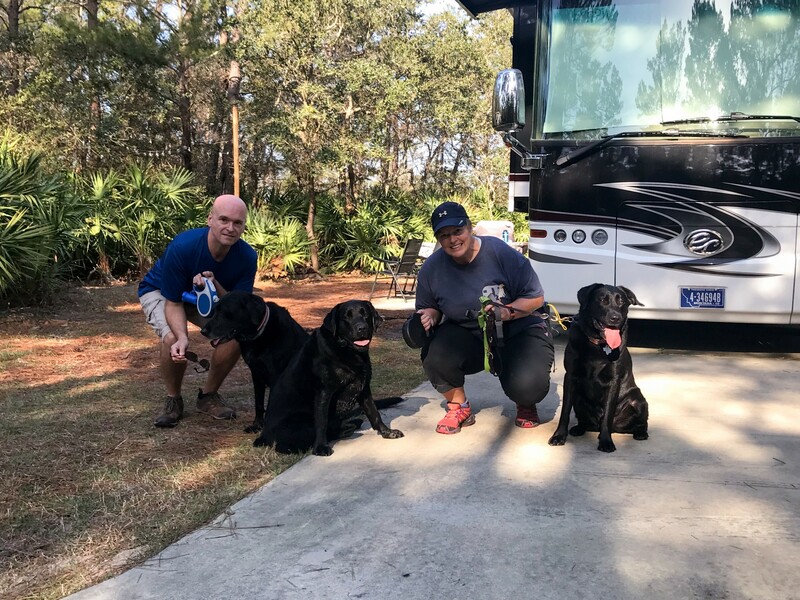 When our max two-week stay was up, we departed Florida and made our way to Meaher State Park in Alabama for a week of much needed introvert quiet time, as well as time to catch up on chores and hobbies. We found Meaher State Park’s campground to be nice, but very small. Strangely, there wasn’t any more to the state park beyond the campground and a boat launch. 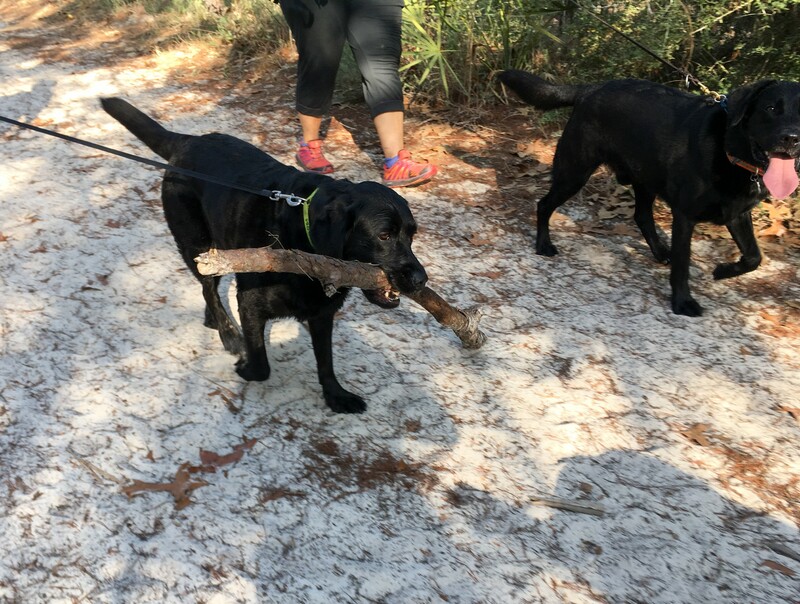 That was a problem for our dog walks… when we think state park, we think large spaces with trails to explore, but we walked Opie from one end to the other in about five minutes and then started wondering where else we could walk him. We did find another public park across the street which was somewhat larger, but that park closed at 5pm every day and required crossing four lanes of busy 60 MPH highway on foot. As a place to stop at while traveling I-10, Meaher works out great, but in the future we wouldn’t stay more than a night or two here. Our last state park for a little while was Bayou Segnette State Park just south of New Orleans, Louisiana. 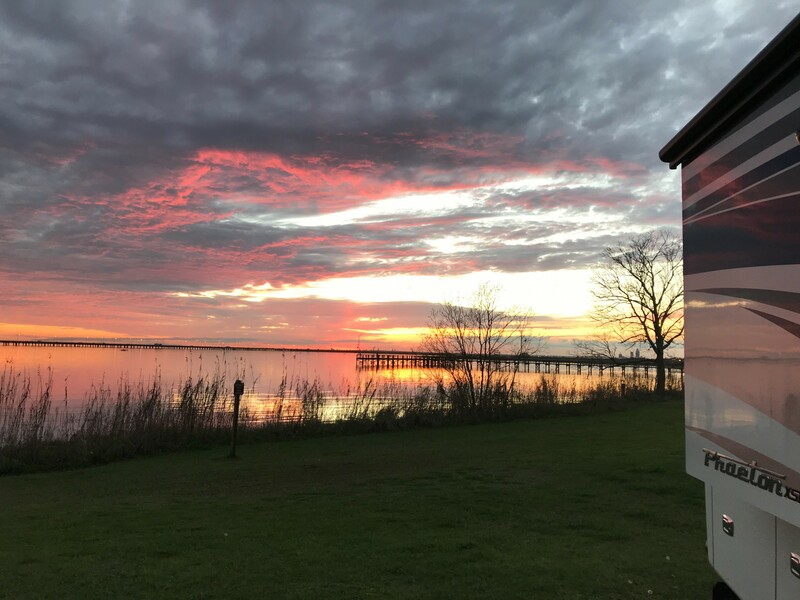 We visited New Orleans during our first year of RV life, and we stayed at a KOA west of the city (we didn’t know much about state parks yet back then). 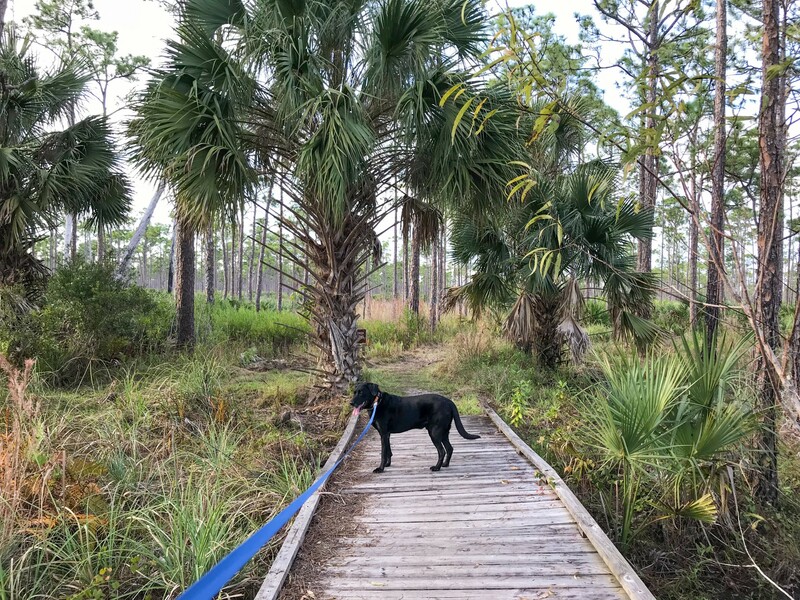 Bayou Segnette had a very large campground and we found plenty of places to walk Opie, though all were more paved walkways than trails. It was about a 20-minute drive to the French Quarter which wasn’t bad, all things considered. As an alternative, you can drive to a nearby ferry which will cross the Mississippi and drop you close to the French Quarter, but we didn’t try that method. 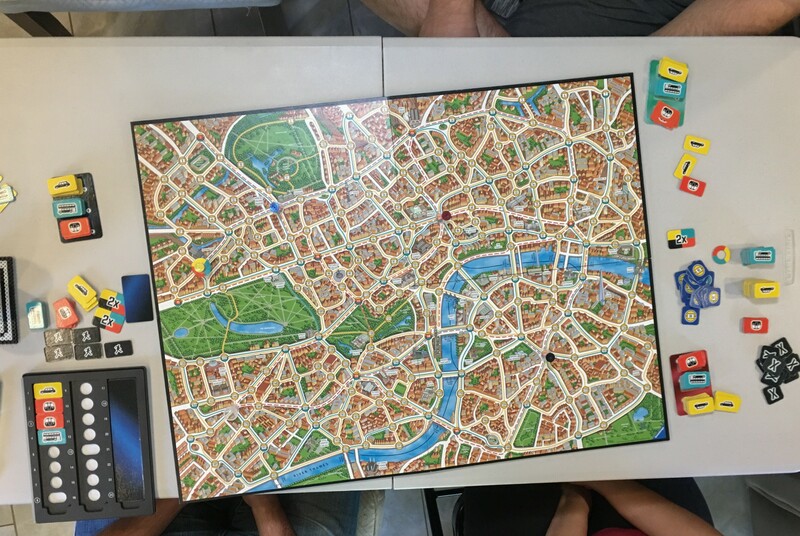 Ben and Lanni (Indoor Nomads) joined us again and we finally got our fill of tabletop gaming, something we haven’t been able to do nearly enough of while on the road. Since we’d done quite a bit of exploration during our first visit (WWII museum, garden district, bus tour, etc.) 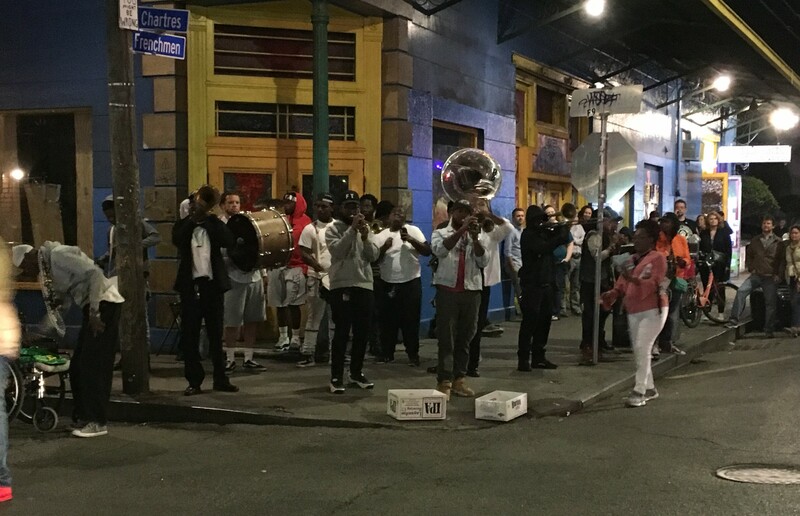 this time we wandered the streets, catching the sounds of music from bars, eating pralines and beignets, and enjoying the sights and sounds. It was surprisingly empty and quiet in early March… I guess everyone was still recovering from Mardi Gras! While in New Orleans we also attempted our first Escape Room. We’ve seen many friends post about them on Facebook and weren’t quite sure what to expect… would it be lame? awesome? somewhere in the middle? 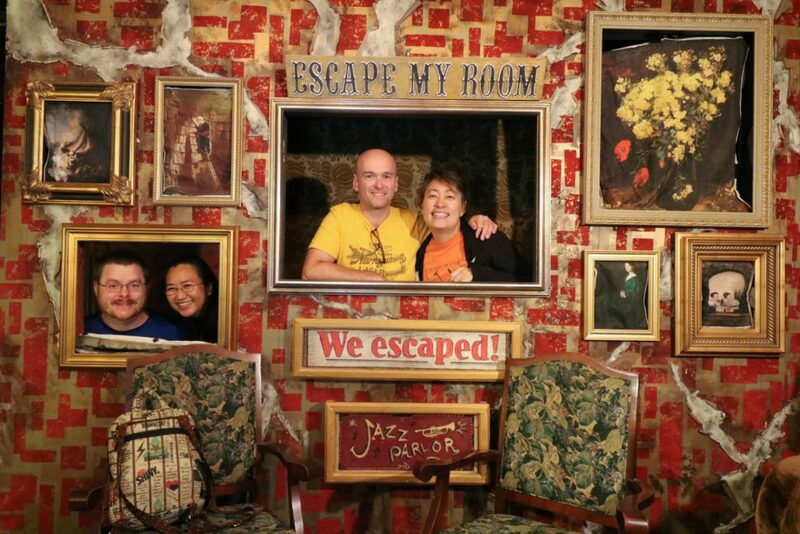 We’re thrilled to report it was a lot of fun and the room we did (Escape My Room’s Jazz Parlor) was very well made. The rooms are designed for 4-6 people, and it’s best to go with friends like we did, rather than get matched up with strangers. 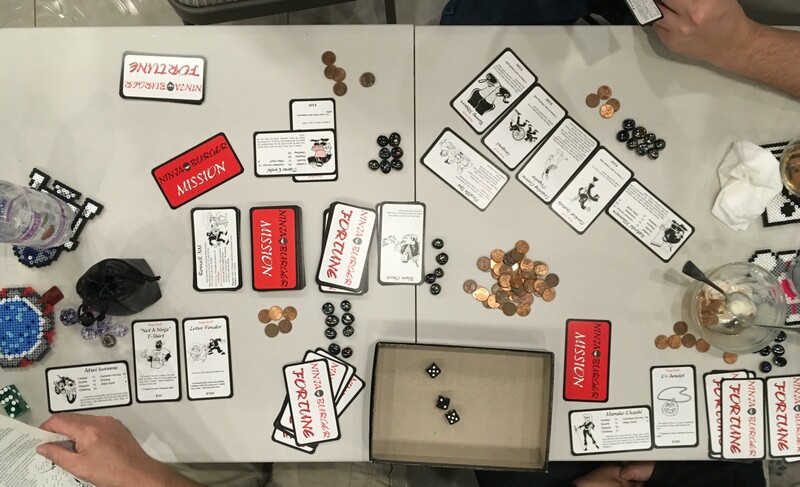 We examined the clues in our room, put pieces of the puzzle together, and eventually discovered a secret door to an adjoining room where more of the story unfolded and more clues awaited. I won’t go into more detail here as I don’t want to spoil it for anyone else… but we do highly recommend this escape room! At this point our state park tour was over… for a little while. Next up, a side-trip to Katy TX to catch up with old friends! Looks like a nice time in Florida! Glad to read what you guys are up to and see more pics of your new rig. Opie looks great too! Uh oh is right on getting stuck! Happy Trails to you 3! Old one was 24,000 lbs. New one is 37,000 lbs! A very timely blog post. I spent a few hours earlier today identifying state parks we might stay at when we visit Florida, Alabama, and Louisiana in a couple of years. I know it is a bit early but I like to plan ahead. Many of the parks I identified for further research you have already been to. Since we will likely have a 40IH by that time with the same custom color scheme (unless Tiffin comes out with a better floorplan or color scheme) it is good to know which parks will be a tight fit. How is the Tiffin Phaeton doing? Any issues with the fixed Tiffin applied? We can’t wait to hear about your trip to Canada this summer. 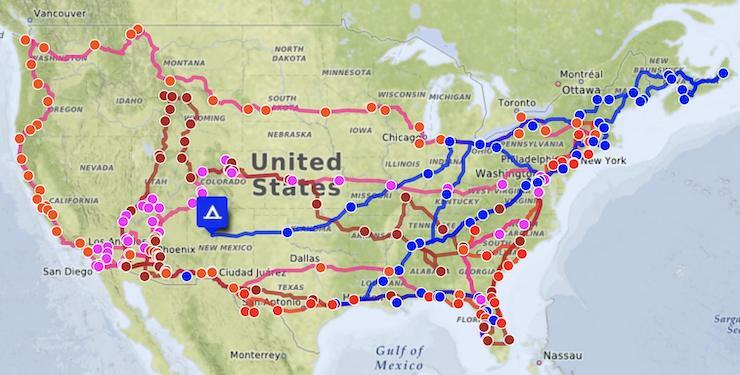 Your route looks like one we want to do in the future. Bill, we’re loving the Phaeton 40 IH. We’ve just stopped in Red Bay AL on our way back north, so we could get some things fixed at the service center. Nothing major, just the expected first-year shake-out items. Silver Springs State Park is one of the nicer state parks in FL. 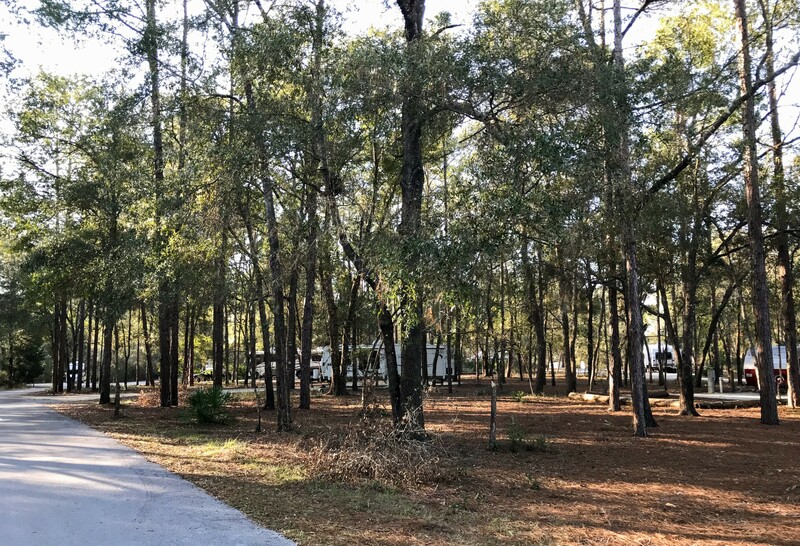 We also like the Silver Springs Campground in the Ocala National Forest which is a little further north, has full hookups and level sites. Like you I’m not fond of the RV parks in FL. Lived not too far from J Dickinson (grew up in DC area and was transplated at 15) and before we bought the RV and went FT we would walk the dogs there. Next time you are there Jupiter has a dog beach which Opie would love. 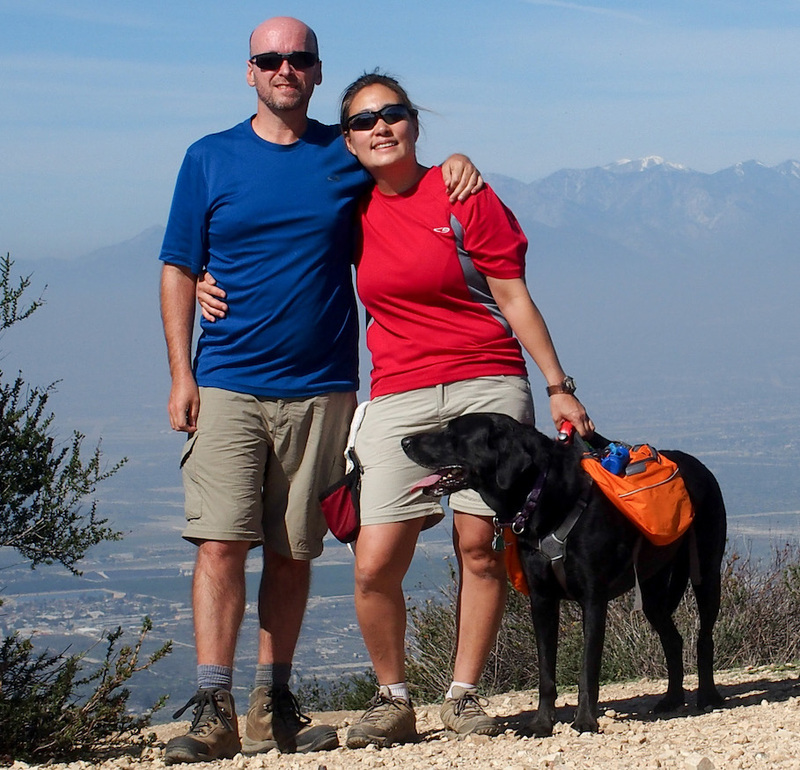 Mike and Kathie … I’m really enjoying your blog. My wife and I currently have an Airstream 31′ trailer and are looking at a Phaeton 40AH. But I have reservations about moving to a motorhome due to the size, getting into state parks, and being vastly more complicated. It is nice to see that you enjoy state parks and your Tiffin is able to access state parks. Also nice to hear that you are happy with the Tiffin. Seems like there is always a lot of complaining on the forums and the people who are happy don’t post as much as the ones with very unrealistic expectations.